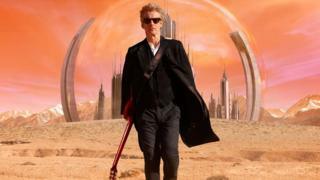 Three years is the maximum length of time anyone should stay in a job, declared actor Peter Capaldi when he explained why he was stepping down from the Dr Who role after four years. "I've never done one job for three years. This is the first time I've done this and I feel it's time for me to move on to different challenges," he said. It's a pretty short tenure compared to the old days when people secured a job after leaving school or university and then stayed there until they collected their golden carriage clock. But increasingly, changing one's job every few years is considered the norm. In fact, a UK worker will change employer every five years on average, according to research by life insurance firm LV=. In the US, it's even shorter with people staying with a single employer for just over four years, according to official statistics. But is there a magic number, one that will make sure you don't stop progressing, but also doesn't make you look too, well, flighty? Claire McCartney, adviser for the CIPD, the professional body for HR and people development, says there's no such thing. "It's very specific to the person. It depends on their career plans, assuming they have any career plans and whether they feel they get the right amount of challenge and flexibility," she says. Ms McCartney does, however, believe there's a minimum tenure, saying just three months in one role before moving on wouldn't look good, unless it was driven by a change in personal circumstances. She also says the size of an organisation can often be a factor in determining how long a person stays, with a smaller company often offering less opportunity for people to progress than a larger rival. Victoria Bethlehem, the group head of talent acquisition at recruitment firm Adecco, says she looks favourably on a prospective employee who has changed roles every three to five years. "Immobility is never desirable in a curriculum. This does not necessarily mean that the candidate needs to have changed several companies and employers. "What's important is to see the candidate has an open attitude to change and a continuous learning approach, driving him or her to embrace new challenges," she adds. In certain sectors, regular change is not only desirable, but a necessity, according to Robert Archer, regional director of human resources at recruitment firm PageGroup. "In technology, advertising and public relations, where professionals are known to change jobs every few years or even months, job hopping can be considered to be a necessity in order to keep up with changes in the market," he says. But Nigel Heap, managing director at recruitment firm Hays UK & Ireland, warns "there can sometimes be a stigma associated with 'job hopping'." "Constantly moving to new roles without demonstrating a good reason might make new employers wary. They may question your ability to commit to an organisation and it may appear that you cannot adapt to new environments and challenges. "If you do move jobs frequently it's important that you clearly outline how long you were in each job on your CV, and support this with clear evidence of what you have learned in each role and what value you can bring to future employers," he says. By far the most influential element driving how often you change jobs is age. In the US, the average tenure of workers aged 55 to 64 was 10.1 years, more than three times the 2.8 years of workers aged 25 to 34, according to the most recent US statistics. The UK doesn't record such data, but London-based Dr Clare Gerada is an example of an older worker who has stayed at the same place for many years. She has worked for the NHS for 40 years and spent 25 years at the same practice. Dr Gerada says this is partly down to her role which offers lots of flexibility and change, but she believes people are inherently designed to put roots down. "Of course when you're young you should move around and do things and experiment, gain experience, but there has to be a point I think that you put roots down and actually start to grow in that job," she told Radio 4's Today programme. But so-called millennials, those born between 1980 and 1999, have very different expectations about jobs. Several surveys suggest that these younger workers aren't motivated by the same factors as previous generations, such as a job for life, but instead value a good work-life balance and a sense of purpose beyond financial success. It's a drastically different outlook from the generations before who are used to the more traditional hierarchy of large corporate firms - staying at the same firm and working a set number of years in a particular post before progressing. Almost a quarter of employed people are currently looking for new roles, according to the CIPD's latest Employee Outlook survey which polled 2,000 UK employees. For companies of course it poses a challenge. Constantly losing staff and their knowledge and having to recruit and retain replacements is costly. Ms McCartney says firms need to do more to try and retain staff, for example holding regular casual chats with staff on career progression. "Companies need to be more creative. There might not be room for promotion, but cross-function working, opportunities to work on special projects and secondments are all ways of boosting skills," she says. But she also says it's important for firms to stay on good terms with departing staff, who may decide to return later on in a different role adding wider experience to their existing knowledge of the firm. "It's not about organisations holding on to people at all costs," she says.